Adam Jordan began his career in audio in 2000, under the instruction of Pete Gage (Nekromantix, The Meteors). In 2002 Adam began working at Main Street Studios alongside Rob Specogna. 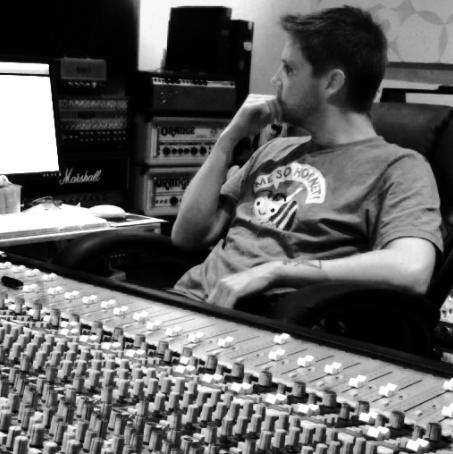 By 2004 Adam was engineering the majority of the sessions at Main Street, working on albums and releases for Australian bands as well as overseas clients. In 2009 Adam took over ownership of the studio and has been working to further build the studios reputation. Since being at Main Street Adam has produced and engineered thousands of recordings for international and national artists as well as film and television projects. Who or what inspired you through your early years to explore your passion for music and audio? As a child, I always had music playing. There is a photo of me as a baby with huge headphones on and breadsticks as drumsticks! I also remember one day when I asked my mum to turn the radio down, she knew that I must not have been feeling well if I wanted the music down. So music has always been a big part of my life, but as a child and teenager, I hadn’t thought about the potential of a career in music. What activities did you participate in whilst you were at school to build your career? I didn’t do music in school. Looking back now, I wish I had. It would have been easier to absorb music theory while younger, even if I didn’t understand it at the time, eventually things make sense, but it is harder to learn new things when older. When you were at school and planning for the next step in further education or training, what were your plans at the time? Did you plan on pursuing audio as a career? At the time of finishing high school, I wanted to be a film writer and director. teachers know I was interested and applied for that when it came up. What steps did you initially take during or after school to develop your career? While studying, I definitely wasn’t proactive enough at approaching studios and trying to gain work experience. I wasn’t arrogant enough to believe I knew everything, but I felt like things would just fall into place, and although they did for me, I don’t recommend this approach! Once the course had finished, I sent the resume out to as many studios as I could find in the local area. Eventually, in the third round of sending resumes, I was invited to interview at Main Street Studios, then I did some work experience. After a couple months, I was doing paid work and about 9 years ago I took over the business and have built it up further. The best part is that every day is always different. Even though the theory and technical part of the job is the same, the difference is in the songs, the style, the artists I’m working with…so no 2 days are ever the same. I also enjoy experimenting and trying new ideas, so that keeps things fresh for me as well. I also love the creativity; I am at the stage with most of my clients where they trust me to be more hands on and experiment with their songs, so it’s fun to see what new ideas we can come up with. Describe a typical day in the studio for you. If drums are done, then that’s when the fun begins with building the sounds and ideas. Each day, being different, is really never typical. These days I work until 7pm (no more 15 hour days for me), I find it best to make sure everyone is well rested and has time to reset their minds before doing it all again the next day. What are your tips for young people who are keen make a career in audio engineering and sound production? Start doing things, ALL THE THINGS! Learn as many instruments as you can, you don’t need to be a master, but have enough knowledge that it is useful. Get out and meet as many musicians as you can, become friends, these will be your clients when you are working, it is all about relationships. Don’t be a rude, arrogant, know-it-all… Accept that fact that others will know more than you and those that you think know less, will still know something you don’t, so learn from everyone and never burn bridges. Music should be about bringing people together so don’t bring negativity into that, don’t bad mouth anyone else or other bands. What have been some of the highlights of your career so far? Watching bands I’ve worked with get signed to labels or touring the world, or even releasing an EP that their friends love… It is all highlights to me, seeing the smile on someone’s face when they hear the song that was in their head now coming out of the speakers, that always makes me happy.